It's really simple. Start by securing a commitment from your group of friends or associates that want to make soup together. Then, go to the Group Bookings section of the Soup Sisters/Broth Brothers web site and check our available dates for soup making at any one of our locations across the country. When you find a suitable date, just contact us at the designated email address for your city to reserve the space and confirm your booking. Please note variations in times, dates, and minimum and maximum group size for each city. Who provides the recipes and ingredients? All recipes for Soup Sisters events come from our special repertoire of healthy and nourishing recipes that have been submitted by Chef supporters, Soup Sister and Broth Brothers participants. Many are featured in our bestselling cookbook. 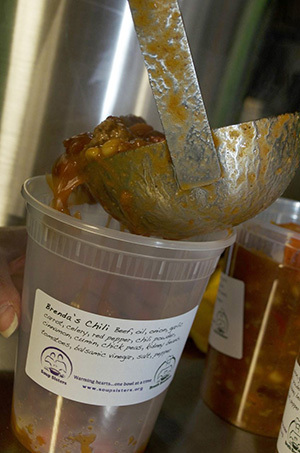 The ingredients for all of our soups will be provided by our commercial kitchen partners. Do we need to bring pots and pans or other kitchen utensils? No. 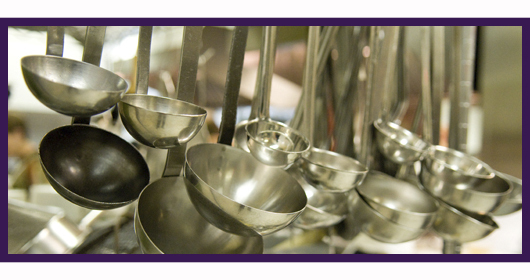 All pots, pans and cooking utensils will be provided by our commercial kitchen partners. What are the costs to the group? Soup Sisters and Broth Brothers events are charged a per person fee to cover the cost of all ingredients, kitchen facilities, Chef facilitator, kitchen staff, your meal and wine at the event. Can I get a tax receipt for the participation fee? The participation fee for a Soup Sisters event covers the expense for use of the venue, equipment, supervision, ingredients for the soups, a Chef or professional facilitator and a culminating meal with wine at every event. This is not a donation to Soup Sisters. Our program is designed so that the donation is the soup and the generosity of participants for their time. Can men attend Soup Sisters events? Absolutely! Soup Sisters and Broth Brothers welcomes men and women at all of our soup-making events. How else can I support this great idea? What do we do with our soup once it is made? Groups will be provided with 1-litre containers to ensure consistent and safe storage of all soups. Each container will have a customizable label to allow you to name your soup, list every ingredient (for allergy-alerts) and specify your date of packaging. 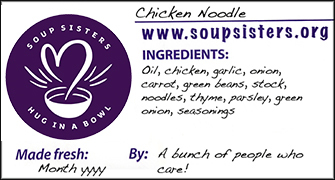 Space on the label is also available to add the name of your group or the individuals who participated in your soup-making event. See sample label below. Many of our soup recipients have a dedicated soup freezer especially for Soup Sisters and Broth Brothers soups for easy access and convenience. 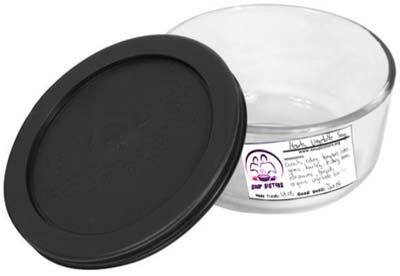 Soup is ladled into plastic 1 litre containers that are microwave safe, freezer safe, and PBA free. How can I help network Soup Sisters? Email our website www.soupsisters.org to your friends, family and colleagues encouraging them to book their own soup-making event. Networking is the key to our growth and sustainability! Can we make soups at home to donate? No, unfortunately not. In order to ensure food safety for our recipients all soups must be made within the controlled environment of our partner certified kitchens. Can we make soups for other organizations? Currently, Soup Sisters and Broth Brothers makes soups only for our mandated recipients: Emergency Women's Shelters for women and children fleeing domestic abuse and for youth in crisis transitioning from street culture into mainstream society. Do I need to know how to cook? Definitely not! All Soup Sisters and Broth Brothers functions will be facilitated by a Chef or professional cook. What if I am an individual without a group? You can still make soup! Please contact us at info@soupsisters.org and we will be happy to place you into a group on a date that works for you. Where does the soup go once it is packaged? Your soup containers will be picked up by our volunteers the morning after your event and delivered to our recipient. Soups made at The Cookbook Co. Cooks will be delivered to the Calgary Women's Emergency Shelter , and The Doorway. Soups made at Sunterra Market Keynote will be delivered to the Awo Taan Healing Lodge and Discovery House. Soups made at ATCO Blue Flame Kitchen will be delivered to YWCA Mary Dover House. Soups made at dish cooking studio will be delivered to Sistering. Soups made at Nella Cucina will be delivered to Eva's Initiatives. Soups made at North West Culinary Academy will be delivered to Kate Booth House,and Koomseh Transition House. Soups made at The Gallery Bistro will be delivered to Joy's Place. Soups made at Ottawa Parkdale Food Centre will be delivered to Interval House Ottawa and Oshki Kizis Lodge. Soups made at Grounded Kitchen and Coffeehouse will be delivered to Youth Services Bureau Ottawa (YSB). Soups made at Sunterra Commerce Place will be delivered to WIN House and YESS. Soups made at Okanagan Street Food will be delivered to Kelowna Women's Shelter. Soups made at Saj Common Kitchen will be delivered to The Richter Street Overnight Program. Soups made at The London Chef will be delivered to Victoria Women's Transition House. Soups made at The Millarville Racetrack and Agricultural Society will be delivered to Rowan House. Soups made at The Culinary Studio will be delivered to ROOF and Marillac Place. Soups made at The Winnipeg Fairmont Hotel will be delivered to Osborne House. Soups made at Kitchen Door Catering will be delivered to Bryony House. Soups made at Fresh Dish Catering will be delivered to Saskatoon Interval House. Soups made at College Boreal will be delivered to YWCA Genevra House. Soups made at 39 Carden Street will be delivered to Guelph-Wellington Women in Crisis. Soups made at Lethbridge Multicultural Centre will be delivered to YWCA Harbour House, Wood's Homes Emergency Youth Shelter and Blackfoot Family Lodge . Par o� commencer si je suis int�ress�? C'est facile! Vous devez d'abord rassembler un groupe d'amis ou de coll�gues qui voudraient participer � l'une de nos soir�es. Consultez ensuite la section r�servations de notre site pour trouver une date et un lieu qui vous convient parmi ceux disponibles. Une fois que vous aurez fait votre choix, envoyez-nous un courriel � l'adresse indiqu�e pour le lieu choisi afin de r�server votre soir�e. Veuillez prendre note que l'horaire et les crit�res pour la taille des groupes varient d'un lieu � l'autre. Qui fournit la recette et les ingr�dients? Toutes nos soir�es utilisent des recettes qui proviennent d'anciens participants et figurent sur notre site web. Quant aux ingr�dients, ils sont fournis par les partenaires de restauration qui nous pr�tent leur cuisine. Dois-je fournir les casseroles et les ustensiles? Non. Tout l'�quipement n�cessaire est fourni par les partenaires de restauration qui nous pr�tent leur cuisine. Quels sont les frais � payer pour un groupe? Les frais sont de 55 $ par personne. Ceci couvre le co�t des ingr�dients, l'utilisation de la cuisine, les frais du chef cuisinier invit� et du personnel de cuisine, et le co�t du vin et du repas � la fin de la soir�e. Vais-je recevoir un re�u aux fins de l'imp�t pour les frais de 55 $? Ces frais couvrent l'utilisation de la cuisine et des installations, le co�t des ingr�dients, les frais du chef cuisinier invit� ou de l'animateur professionnel, les frais du personnel de cuisine, et le co�t du vin et du repas � la fin de la soir�e. Il s'agit de frais de participation et non d'un don. Notre programme est fond� sur la g�n�rosit� des participants qui donnent de leur temps et remettent gratuitement la soupe qu'ils ont pr�par�e. Puis-je participer � une soir�e si je suis un homme? Absolument! Les femmes et les hommes sont les bienvenus � toutes nos soir�es. Y a-t-il d'autres moyens de contribuer � votre initiative? Suivez ce lien pour consulter toutes les options qui s'offrent � vous si vous d�sirez appuyer nos efforts. Qu'arrive-t-il avec toute la soupe � la fin de la soir�e? La plupart de ces organismes et refuges ont un cong�lateur servant exclusivement � entreposer les soupes que nous leur livrons. Nos contenants de verre d'une capacit� de 1 litre (4 tasses) sont r�utilisables et peuvent aller au cong�lateur, au four conventionnel ou au four micro-ondes. Nous les distribuons � nos partenaires de restauration et aux organismes b�n�ficiaires. Comment pourrais-je promouvoir vos activit�s? Envoyez un courriel � vos amis, � vos coll�gues et aux membres de votre famille en mentionnant notre site web - www.soupsisters.org - et en les encourageant � r�server leur propre soir�e. Nous comptons sur vous pour �tendre notre r�seau! Peut-on organiser une soir�e chez soi? Malheureusement, non. La pr�paration des soupes doit se faire dans la cuisine professionnelle de nos partenaires de restauration afin d'assurer un certain niveau de salubrit� et de qualit�. Peut-on choisir d'autres organismes r�cipiendaires pour notre soir�e? Pas pour l'instant. Les soupes pr�par�es lors d'une soir�e Soup Sisters sont livr�es � des refuges pour femmes battues et celles pr�par�es lors d'une soir�e Broth Brothers sont livr�es � un organisme venant en aide aux jeunes sans-abris. Dois-je savoir faire la cuisine pour participer? Absolument pas! Toutes nos soir�es sont dirig�es par un chef cuisinier professionnel qui s'assure que la pr�paration se d�roule correctement. Dois-je faire partie d'un groupe pour participer? Si vous n'avez pas de groupe, envoyez-nous un courriel � info@soupsisters.org et nous tenterons de vous ajouter � la liste des participants d'une soir�e qui aura lieu � une date qui vous convient. Qu'arrive-t-il avec les contenants de soupe? Nos b�n�voles se chargeront de les livrer aux organismes b�n�ficiaires le lendemain de votre soir�e. Les soupes pr�par�es � The Cookbook Co. Cooks seront livr�es aux refuges Calgary Women's Emergency Shelter , Awo Taan Healing Lodge et The Doorway. Les soupes pr�par�es � Sunterra Market Keynote seront livr�es aux refuges Calgary Women's Emergency Shelter , Awo Taan Healing Lodge et The Doorway. Les soupes pr�par�es � dish cooking studio seront livr�es aux refuge Interval House. Les soupes pr�par�es � Great Cooks on Eight seront livr�es aux refuges Women's Habitat et Eva's Initiatives. Les soupes pr�par�es � the Dirty Apron Cooking School seront livr�es aux refuges Kate Booth House, Broadway Youth Resource Centre et Koomseh Transition House. Les soupes pr�par�es � The Urban Element seront livr�es aux refuges Interval House Ottawa et Oshki Kizis Lodge. Les soupes pr�par�es � Sunterra Commerce Place seront livr�es aux organismes WIN House et YESS. Les soupes pr�par�es � Okanagan Street Food seront livr�es au refuge Kelowna Women's Shelter. Les soupes pr�par�es � The London Chef seront livr�es au refuge Victoria Women's Transition House. Les soupes pr�par�es � Diamond Willow Artisan Retreat seront livr�es au refuge Rowan House. Les soupes pr�par�es � The Culinary Studio seront livr�es aux refuges ROOF et Marillac Place.